After a long drive up I-5 North, I am feeling tired and ready to be there. My destination is Belcampo in Mt. 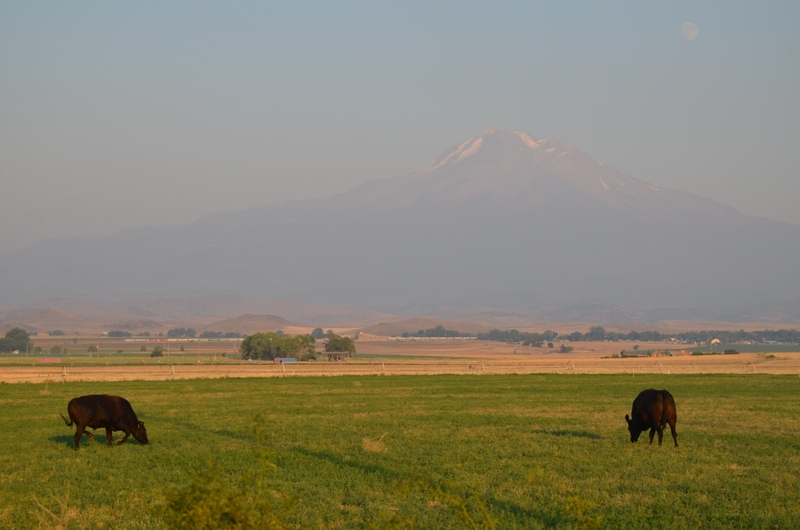 Shasta, California; an acclaimed sustainable farm. I am arriving from Napa Valley where I had the wonderful opportunity to check out two leading boutique hotels, eat mouthwatering “farm to table” meals and of course, drink good California vino. It is day four of my solo Northern California road trip. Upon pulling into Mt. Shasta Valley, the air begins to feel cool and crisp, the light turns golden, and the energy shifts. The afternoon becomes calm and peaceful. It is indeed a gorgeous part of the country. I turn off the busy interstate, drive down flat country roads, and finally see the bright red barn in the distance with the famous Belcampo logo painted on it so beautifully. I have arrived. At Florblanca, we are proud to be a certified sustainable hotel, and are always looking to grow our sustainable projects. For me, food is at the top of my list of what is next for our sustainable efforts. My long term goal is to offer only local, seasonal, and sustainable ingredients to our guests, and ensure that those who visit Florblanca are eating as naturally and as healthy as possible. I also want to support local farmers, gardeners, fishermen and breeders. In our area, the buzz is growing louder and we are seeing more farms pop up, and more awareness of what it means to eat locally. See our recent post on our Farm to Table Menu at Nectar. With my dream of making Florblanca’s food supply more sustainable, I am extremely excited to get the chance to see and experience Belcampo first hand. I spend that evening touring Belcampo on a four wheeler with swine expert, Kylan Hoover. Kylan joined the initial project that would go on to become Belcampo in May of 2009. Prior to that, he managed his own small woodland pig farm in the mountains above Livermore, California. To me it seemed like a huge step working for Belcampo with over 20,000 acres and a range of agriculture that includes pork, beef, chickens, hens, rabbits, as well as the beautiful garden where I picked my veggies for dinner. But Kylan explained to me how the “old tradition” methods of breeding and raising animals and irrigating pastures work best, no matter the size or scope of any given farm. Their company is unique in the sense that from pasture to plate, they are in control of 100% of the process. They manage the entire production chain. Because they are frequently moving the animals to different pastures, they would like to be able to use the hilly parts of the property. They are in the process of figuring out how to keep the water supply on the mountains of the farm. The Belcampo barn, a very hip and laid back office space, is where Kylan and a small team of experts work day in and day out on these types of issues. Every single person I met was radiating a sense of love and passion for Belcampo and their mission. They are proud of their work, and they should be. Kylan and I spend hours driving, talking, and walking the pastures. I’m learning so much about what it really means to be a “sustainable” farm. We end the evening by playing with the piglets as the golden sun drops behind Mt. Shasta. We spend an hour or so discussing the challenges of sustainable tourism as well as the rewards of running a hotel that is attempting to do it right. It was a pleasure meeting Anya, learning about her vision, and feeling her energy for this project. As I walk out the door, Anya is given her first look at the flyer she has asked to be produced for an upcoming event called Eat Real. Eat Real is an annual street food festival that celebrates good food while teaching participants where the food comes from, and how they can grow and raise their own. She smiles to her employee, and gives her approval. I applaud Anya, Kylan, and everyone at Belcampo for their complete dedication to sustainable farming and their efforts with sustainable tourism. They are a role model for future generations. Thank you Belcampo for hosting me, and I hope to welcome you to Florblanca one day. For more info on Belcampo, visit www.belcampoinc.com.